I’ve perhaps left it a little too long to try to produce any sort of garden round-up for 2009. 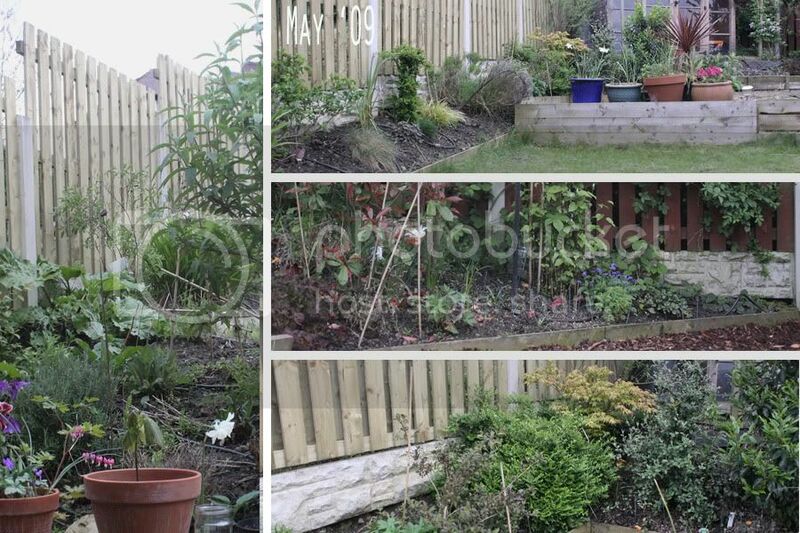 However I can remember that the major work in the garden consisted of having new fence panels put in which would afford more privacy as well as allowing for larger climbers to be planted. I went for slatted panels which would allow airflow and hopefully suffer less damage in high winds. Planting was attempted on a budget – i.e. I attempted to grow mainly from seeds, but as I am well aware now three years down the line, it just isn’t possible not to buy anything at all! My ‘main’ border was initially the Buddleja border – then known as the left or kitchen border. Since then I have battled with this border every year; the problems are generally caused by the Buddleja which grows to gargantuan proportions, casts a lot of shade and also takes a lot of water. As the border is almost full south-facing this means the back of the border which faces the kitchen become hot, dry shade. But the top of the border which faces the lawn is full sun, hot and dry. The border also slopes down hill toward the house, which adds yet another level of difficulty as most of the time I view the border from the house, this is the shadiest area and at the lowest point. So often from this side it looks bare and lifeless. I’ve tried various different tactics; shade plants, sun plants and yet I am still to finally crack it and have a fantastic show. 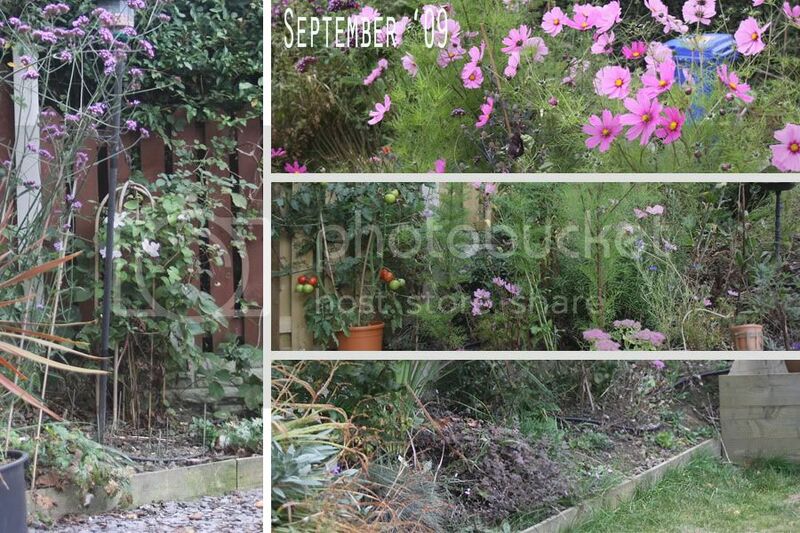 However, in 2009, looking at the photos it does seem that actually the Buddleja border looked quite nice! 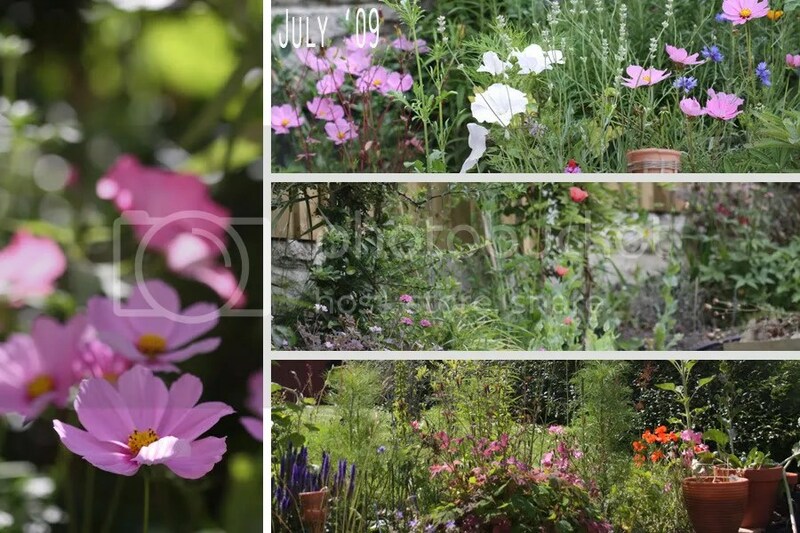 I had cosmos in the border this year, and although small they did certainly add plenty of colour when combined with Lavatera. In May there didn’t seem to be a great deal happening in the garden, with very few blooms around. As it would happen, all the blooms were pretty much only in the lower half of the garden, closer to the house. Cosmos were probably the main feature of the garden in 2009, it was the first year I had ever had them and the intention was to have them just as a gap filler until the garden matures… They have since been a feature every year – well, I say a feature but it has been a love-hate relationship with them… Where they haven’t begun blooming until September and even late October. In September the Cosmos stole the show and were amazing, I referred to them as my Cosmos trees because they were so massive. They are certainly a quick fix for anyone looking to fill a border quickly and quite easily. Looking back on these photos of the other borders it’s easy to see why plenty of work was done in 2010 and I think pretty much all the borders had a make-over.